Punch line at the auto auction. Hard to argue with JDM drivers bold enough to emblazon “But Did You Die” across their windshield. 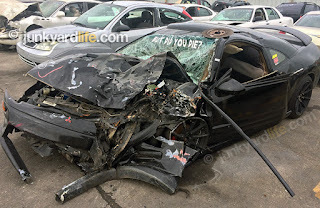 I ran across this demolished 3rd generation Mitsubishi Eclipse GT at Weil Wrecker’s auto auction in Birmingham, Alabama in December 2016. 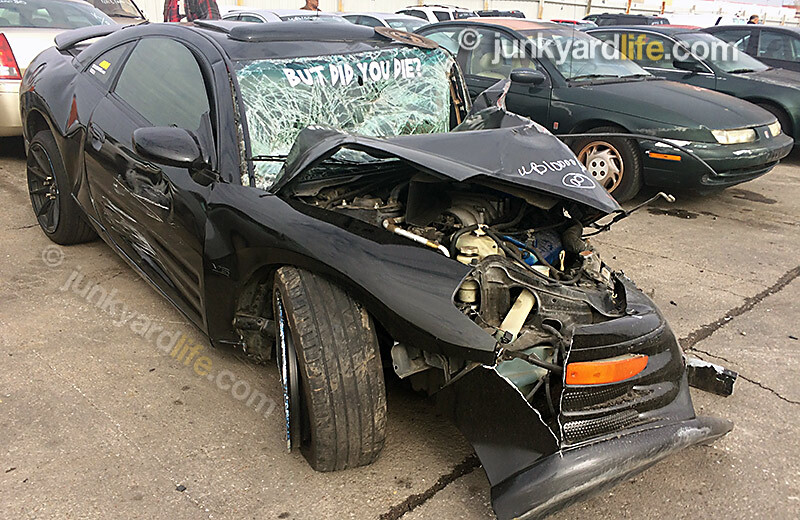 The battered black remains look to be a 2000-2002 model Eclipse, judging by the solid red tail lights. Not much was salvageable. Winning bid was only a few hundred bucks. The decal on the Mitsubishi Eclipse provided some uneasy chuckles at the wrecker yard auto auction. 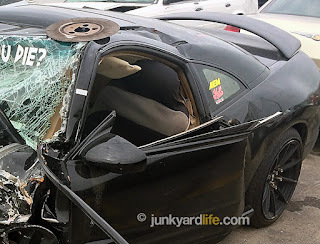 Hopefully the driver was flying solo and walked away. But, if he did have a co-pilot, at least they had ample warning about becoming a crash test dummy. Be safe on the roads. Watch for decals like these. They may be your only warning signal that the driver is prone to questionable judgement. Severe front end damage with the brunt being on the driver’s side. Seat is poking out the driver’s side window of the Mitsubishi Eclipse. 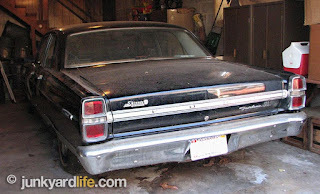 Babysitter’s Fairlane. Automotive journalism affords a guy opportunities that other neighborhood busybodies may not be aware of. Things may be hiding in otherwise plain sight. Such is the case with this car. 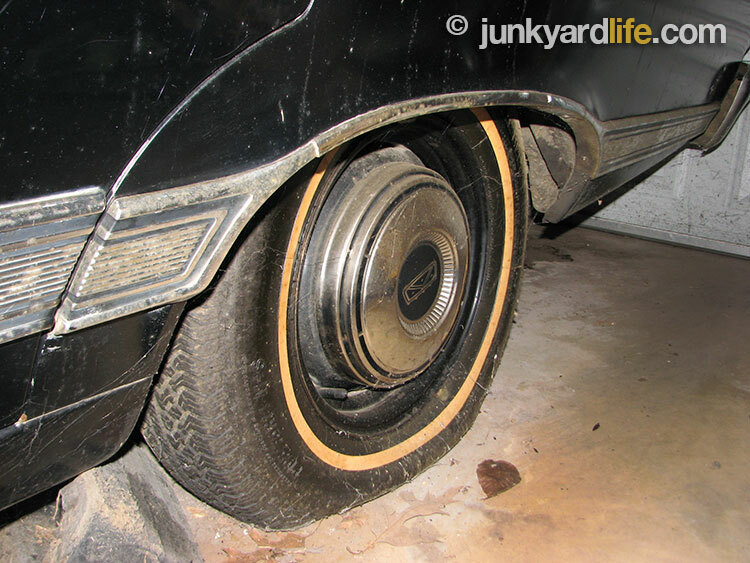 Residents of the neighborhood where I (Ron) grew up mentioned this mystery car from time to time. 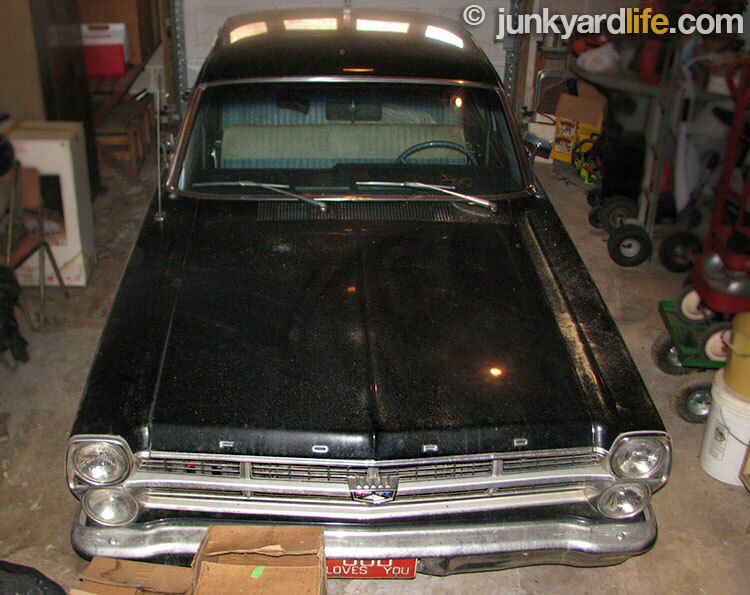 They thought it may very well be a 1963 Ford Galaxy or even an LTD still in the hands of its original owner. So, I went to the door. Why would someone let me in? I thought maybe because I had a camera and a notebook as well as a passion for older cars. Maybe because I made it clear I am not trying to buy it, but would just love to see it. Still, why let someone in you don’t really know? 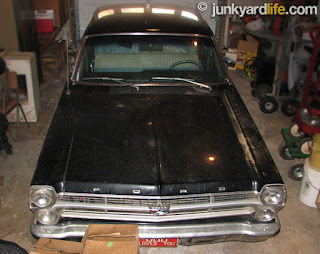 The car turned out to be a 1967 Ford Fairlane 500 four-door sedan. 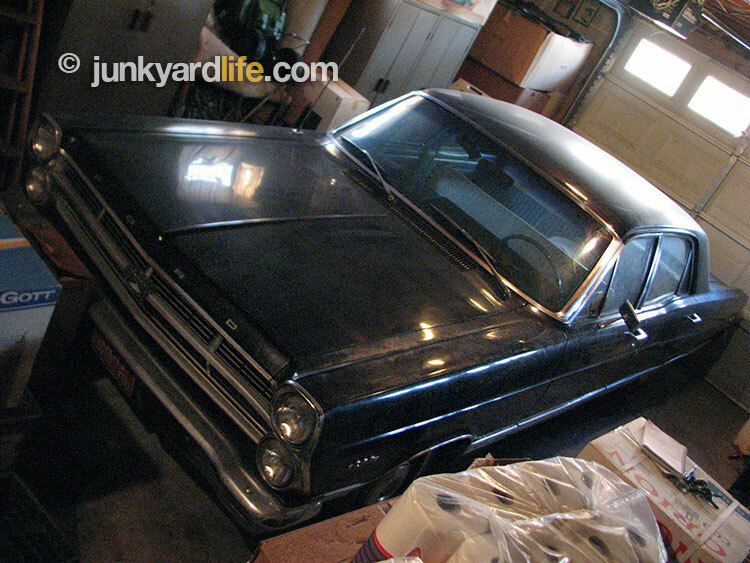 It had several attributes that would be the envy of anyone attempting to restore an older vehicle. This beautiful sedan did not need restoration. It was a true one-owner survivor. 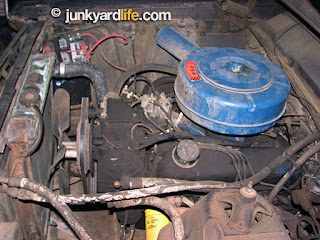 Powered by a 289 V8, a manual 3-speed on the column, and a great story that I needed to know! 1967 Ford Fairlane 500 has a three-speed column shift transmission. It seems in February of 1967, Mr. S (name protected) had an errand to run at a local Ford dealership. 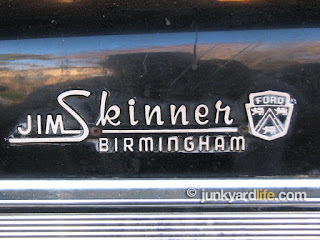 On the lot of Jim Skinner Ford, on the eastern side of Birmingham, Alabama, Mr. S spotted the car that would be a part of the family from that point forth. A brand new 1967 Ford Fairlane 500 in Raven Black. 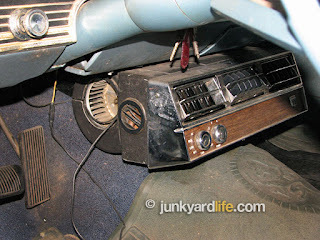 It had a peppy 289-cubic-inch V8 under the hood and propelled itself with a manual three-speed, shifted on the column. This four-door sedan would be a perfect family car. Now to work on that "family" part. 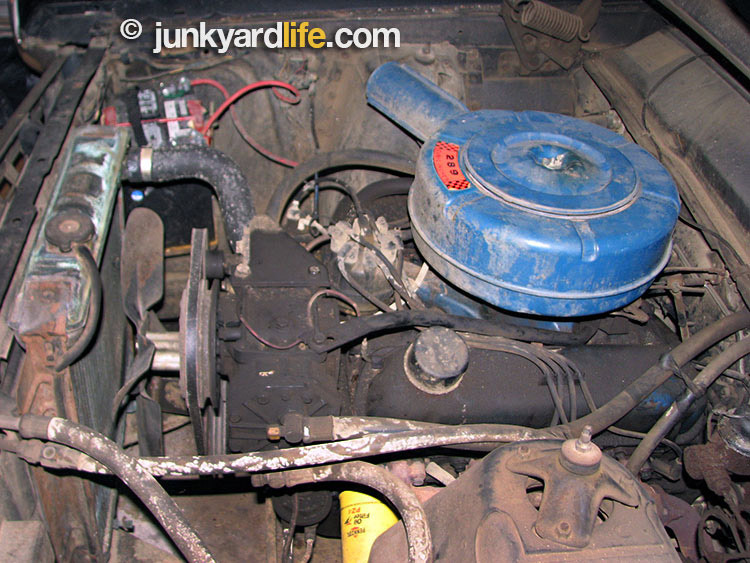 All original 289-V8 engine sits under hood of the ’67 Fairlane. After surprising his girlfriend (the future Mrs. S) with the grand arrival in the new sedan. It was just the inspiration a guy needs — they were married in September of 1967. They took the car on their honeymoon to Gary, Indiana. It also served them on trips as far north as Canada. 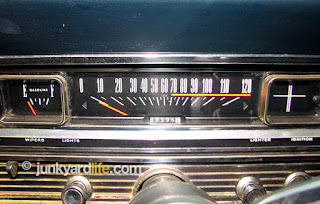 After the addition of aftermarket air conditioning, they drove the black Ford way down south to Florida. However, don’t get the idea that this car was in steady rotation. 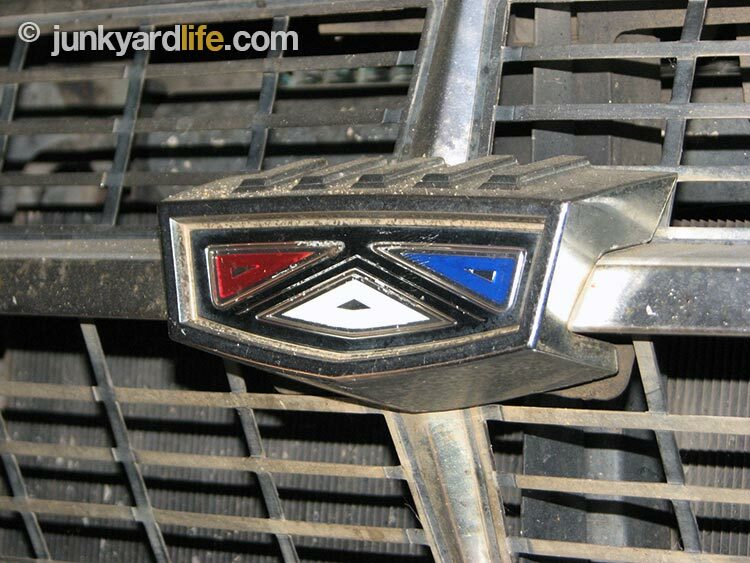 It was driven sparingly and cared for meticulously. A mere 68,396 miles on the odometer. 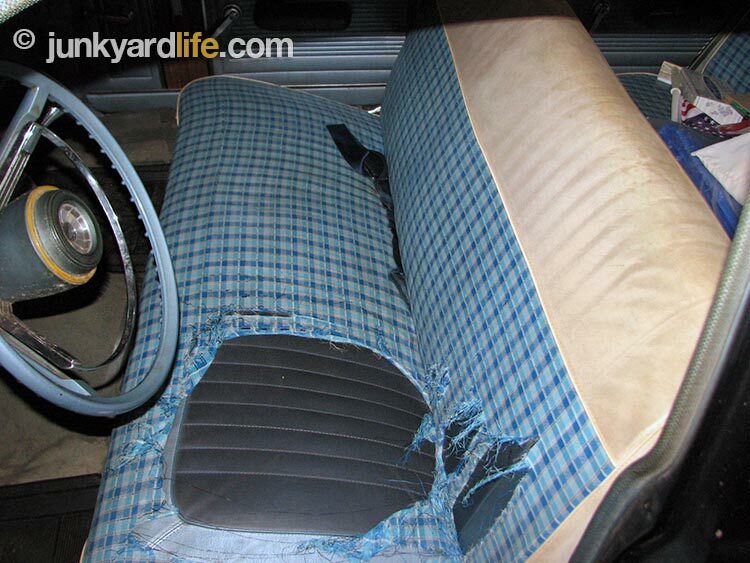 Seat covers protected the 1967 Fairlane’s original seats from wear. Years later, the car is still in the hands of Mrs. S. She kindly let me take as many photos as I wanted and graciously offered to move things around in her garage to take better photos. 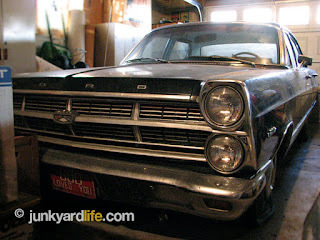 I was amazed at the condition of this classic Ford. 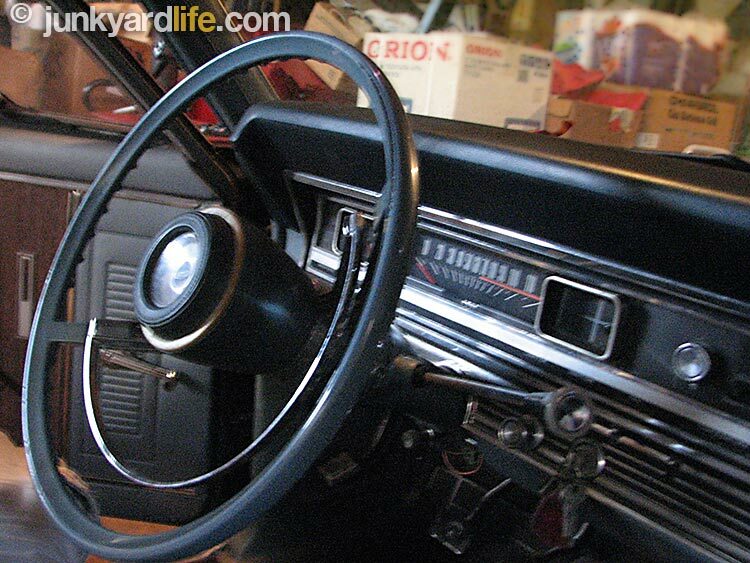 Most people would not have preserved a spartan four-door sedan the way Mr. S did. They covered the seats when the Fairlane was new, to protect the original material from harm. Clearly, this car did not see much rain or snow. In Alabama, the sun can be violent. It is especially not kind to black paint that tends to hold heat. Somehow, Mr. and Mrs. S protected it from that too. 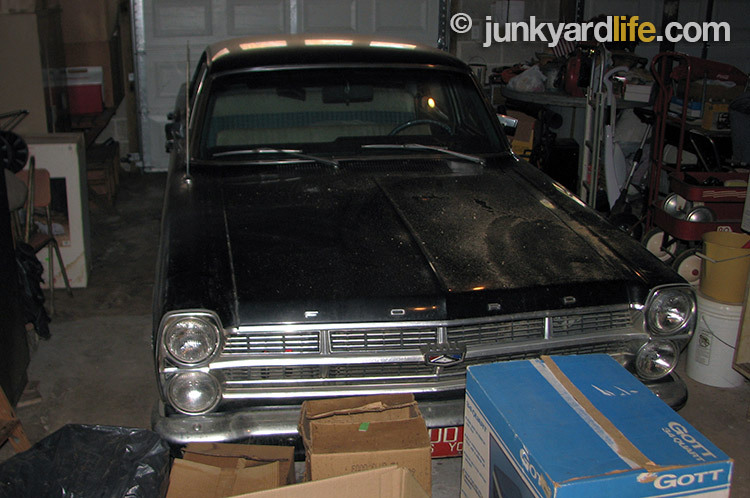 The Raven Black four-door 1967 Ford Fairlane has lived in this garage for 50 years. My lovely visit with Mrs. S and my photo shoot came to an end. As I was leaving, I mentioned that my grandmother lived down the street and perhaps she had known her. “No, but I know you,” she replied. She knew me? How did she know me? That explains the friendly greeting and the “Come on in” I encountered earlier. But how? 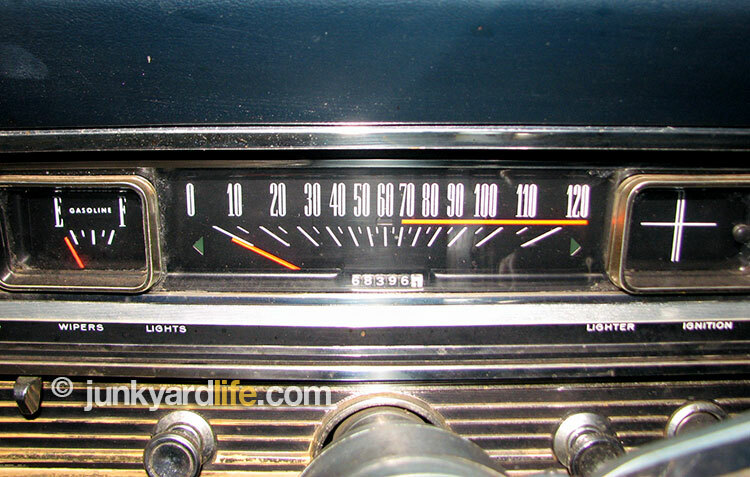 The speed warning option made an annoying buzzing sound to nag you if you exceeded the preset limit. After Mr. S added the wife option the warning buzzer was no longer needed. How do you know me?, I asked. Maybe she is a reader of Junkyard Life (editor’s note: Ron always thinks that no matter how unlikely). “I used to babysit you when your parents moved over to Paris Street when you were about five years old,” said Mrs. S.
So, I have been here before?, I said. “Yes, several times. You played here in the den and out in the yard with a couple of other kids,” said Mrs. S.
So, instead of saying salutations like, “Nice to meet you,” I was pleased to say, “In that case, great to see you again.” The déjà vu of classic cars and nice people. It was comforting to hear her say “They always come back.” Yes we do. 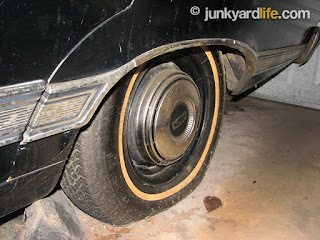 Fairlane 500 hub caps, all intact and in great shape. Though not a 1967 fact, Ford introduced us to the Fairlane name in 1955. Affluent people often named their estates. The car was named after Henry Ford’s estate in Michigan “Fair Lane”. 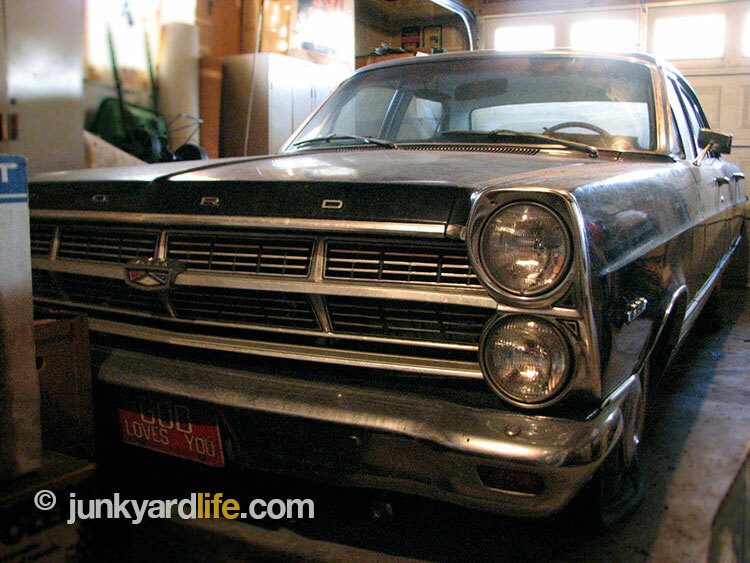 The 1967 model was the last of the fifth generation Fairlane models. 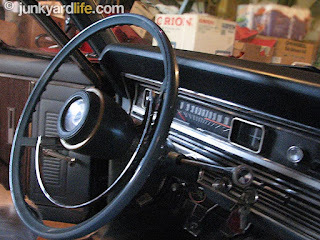 Changes occurred to the Fairlane in 1968. It was rumored that Ford produced 57 super hot 427 c.i.d Fairlanes with 425 horses to meet requirements of the NHRA and IHRA racing. Imagine how fast that would be in this chassis. 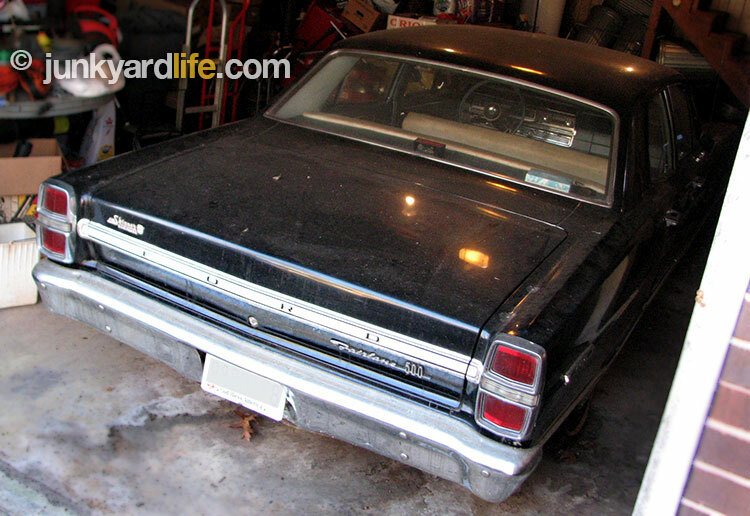 May not be a fact, but it does not appear that Ford gave us a four-door hardtop. They seem to all be sedans. Ford built 51,522 four-door sedans in the 500 trim level. 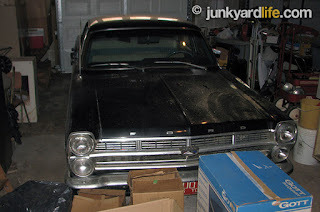 A large chunk of the the total 238,688 Fairlanes (according to myclassicgarage.com). So it was not the rarest of the bunch. However, our feature car is an outstanding example. The rarest Fairlane would be the 500XL convertible. Only 1,943 built. 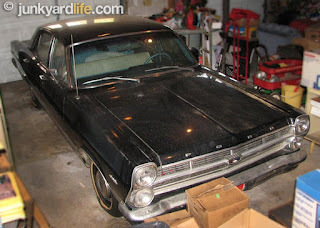 Do you have a classic or muscle car in the yard or a barn find? Send us details and we’re on the way! Send emails to Jody Potter at junkyardbull@gmail.com or Ron Kidd at Kidd403@bellsouth.net. 1967 Ford Fairlane rear bumper teases those passing by the open garage door. Under dash air conditioning was added before a trip to Florida decades ago. 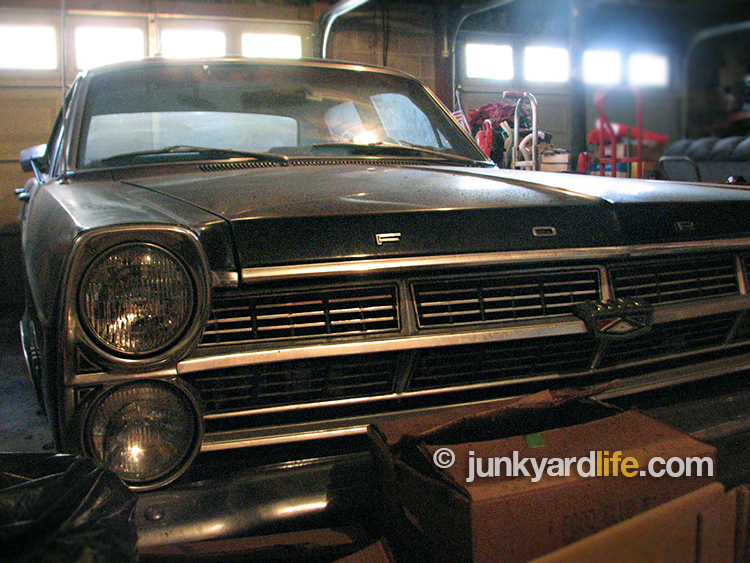 Clean lines on this one-owner 1967 Fairlane 500 in the garage. 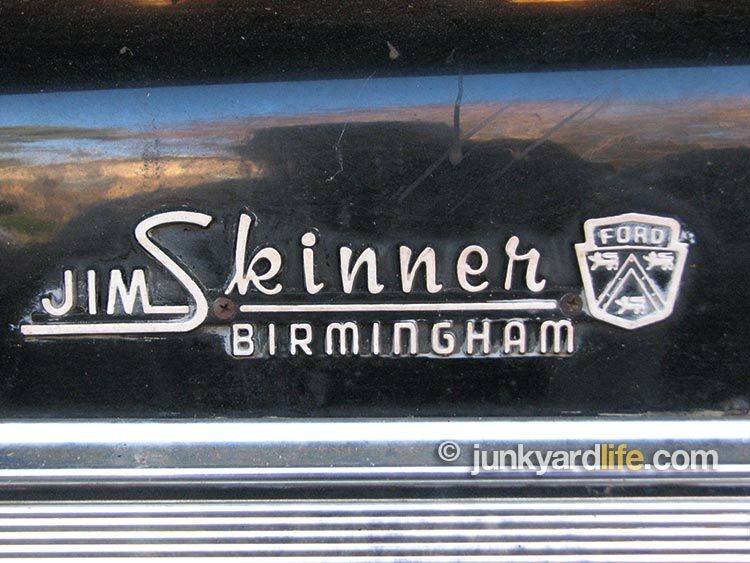 Original Jim Skinner Ford dealer plate on the trunk lid of 1967 Ford Fairlane. The black 1967 Ford Fairlane sits in garage surrounded by 50 years of life accumulation. 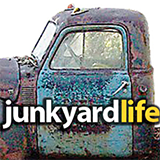 The owner was gracious to let Junkyard Life’s Ron Kidd in for the story. A red ‘God Loves You’ tag mounted on the front bumper. 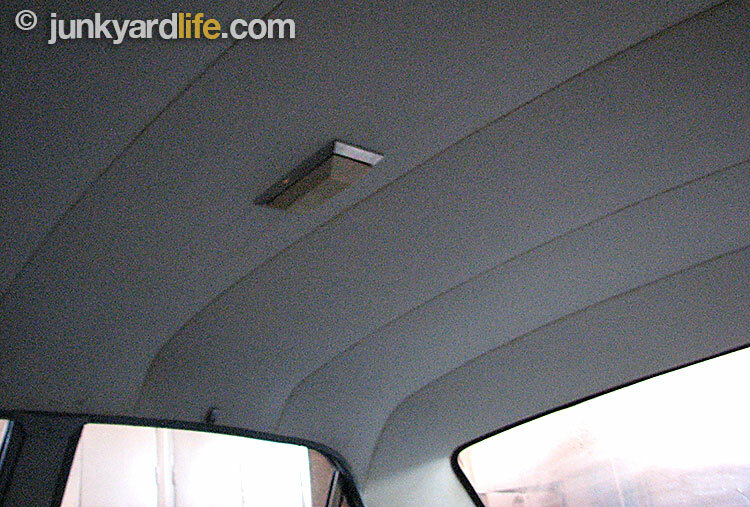 White headliner is like-new in the black 1967 Fairlane. 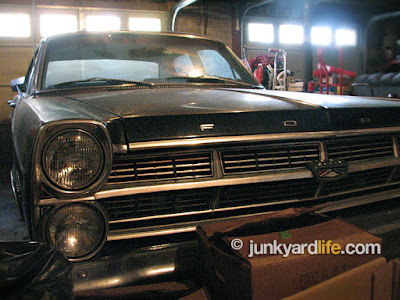 The mystery of the one-owner 1967 Fairlane revealed more than a good car story but a connection to a babysitter from 40 years ago.